a) Engineering degree course of 4 years duration (8 semesters) in the disciplines of Civil, Mechanical, Electrical and Electronics, Electronics and Telecommunication, computer science, automobile and chemical Engineering, architecture, textiles, mining, rubber technology, naval architecture, petroleum engineering, pharmacy, printing, chemical technology. b) Metallurgical engineering, instrumentation and control and aeronautical engineering. c)Diploma courses of not less than 3 years duration in the disciplines mentioned above. d)Medical courses in Allopathy, Homeopathy and Ayurvedic forms of medicines, Veterinary Science. e) Diploma course of not less than 2 years duration in B.Pharma f) Management courses of duration not less than 2 years after degree course. iii) All the columns of application form should be filled in and signed by the teacher. The application should also have the signature and official seal of the Head of the Institution where the teacher is employed and the Secretary Treasurer of the State Working Committee. v) A certificate from the college/Institute in which the student is studying should be attached to the application The certificate should contain the name of the student, name of father/mother serving in school, date of admission in the first year and the year (with number of semesters) studied in 2014-15. The certificate should bear the signature of the Principal; a specimen copy of the certificate is enclosed for quidarjce In case, the certificate from 'the college is In a regional language, then, In addition to the certificate, a translated version in English/Hindi self attested by the applicant teacher should be submitted. the break-Up of such receipts and the amount paid towards tuition, library or laboratory charges, i.e... from the college authorities by way of a certificate The maximum financial assistance payable is Rs 15000/- per year, per case. 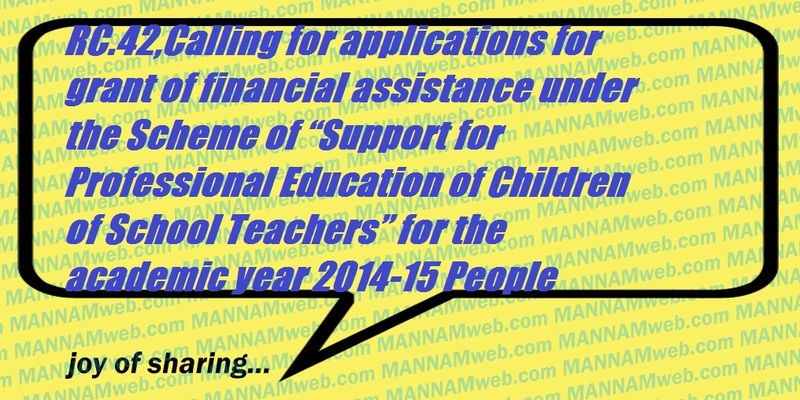 students are forwarded to NFTW for financial assistance. Those cases in which the result is awaited may not be forwarded. xi) Not more than one application from a teacher should be accepted. A teacher can claim assistance in respect of one ward only in a given year. xii) Priority should be.given to those teachers who have not availed the benefit of the scheme in previous years. xiii) No financial assistance is granted to student/ward who is/has studying/studied abroad for professional education. xv) The State Working Committees are required to ensure that applications submitted by the teachers are complete in all respects and necessary documents are enclosed with it. Incomplete applications or applications without having necessary documents will be rejected. No request for reconsideration of the application will be entertained by the Foundation. Last date for submission of applications for year 2014-15 is 31 July 2017. Applications received beyond this date will not be considered under any circumstances.